This entry was posted on Friday, October 18th, 2013 at 12:00 am and is filed under Comics. You can follow any responses to this entry through the RSS 2.0 feed. Both comments and pings are currently closed. Specifically, it’s saving in the large middle 3D Lumiose City, then turning off the game. 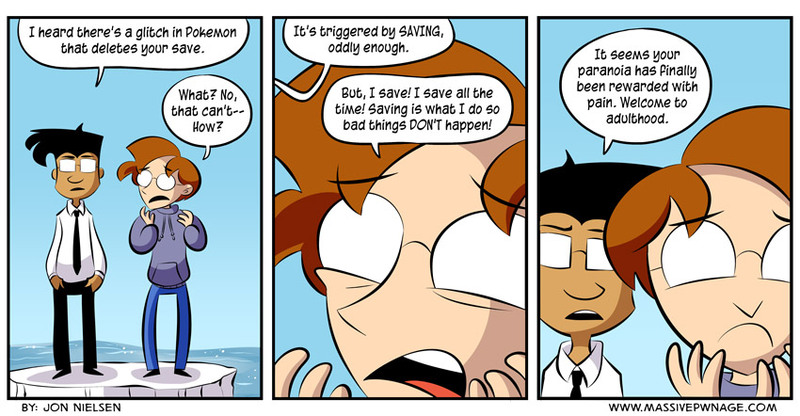 X and Y apparently have a lot of trouble loading that city from a save file. Save inside of a building if you must save in that city. They are, apparently, working on a patch already. It has something to do with this being the biggest city they’ve ever tried to render.